SuperJ - Salt Lake City Staying dry is a good thing "This set, while inexpensive, is a very good purchase! The cloth is very waterproof and beads water off very well. I gave this as a gift to my sister and it fits over her riding gear no problem. As an added bonus, She doesnt look like a marshmallow in it! Might be a little fragile so I wouldnt recommend using this to rough it in the bush for too long"
Rudy - Utah Fantastic jacket "The fit is perfect great quality and stylish"
For some riding is a way of life. It's how we get to the store, run errands and "drive" to work. On the weekends, it's our hobby and entertainment. If we let foul weather dictate when and if we ride then our motorcycle tends to collect dust. We all can't live in the Southwest and for us at MotoSport rain in the Pacific Northwest is nearly a year round pattern. Double water proof protection, liner pants, breathable nylon shell, micro-porous, non-woven, taped and sealed seams all describe the industry standard and latest advanced innovations in motorcycle rain gear. Today's motorcycle rain gear does indeed keep you warm and dry in a down pour. Fickle users delight in MotoSport's variety of one- and two-piece suit options and we give ladies who ride the stylish wear they crave. 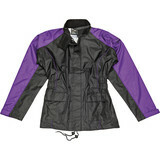 Motorcycle rain gear comes moderately priced and is a must have for the serious rider. We also have boot covers and for those who prefer it, bibs. Put on some rain gear if it's wet outside or throw it in a bag, just in case, and let's ride. Use the size charts to help you take the guess work out of selecting your product. Even if a product doesn't fit, our hassle free return policy means we make it easy for you to get the right one. Shop MotoSport for all your motorcycle rain gear needs. Have a question or need help picking the right product? Call our toll free line 866-677-7338. Get the largest selection of motorcycle rain gear delivered to your door with free 3-day express shipping on most orders more than $79 from MotoSport!